Suicide Squad’s principal photography lasted from April to August of last year, but like a lot of blockbusters nowadays, it’s now gone back for reshoots. The reason for this reported last week was to add more lightness and humor to the movie following the positive reception to the January trailer. However, according to star Jai Courtney, the reshoots aren’t happening for tonal reasons, but to add more action to the blockbuster. I wouldn’t say we’re going back to make it funnier. There’s some additional action stuff that we’ve been doing, which is really dope. 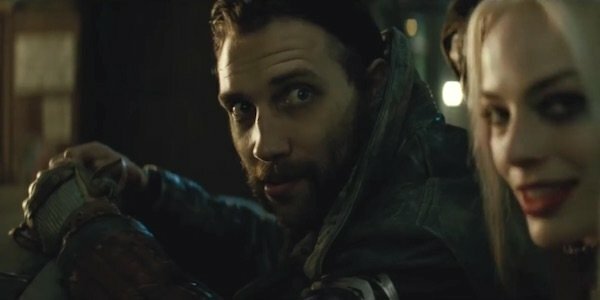 While the Suicide Squad footage shown last year during San Diego Comic-Con presented a fairly gloomy look at the black-ops super villain team’s adventure, the January trailer did a major turnaround with a lot of fun moments and humorous lines sprinkled throughout while Queen’s “Bohemian Rhapsody played.” Last week’s report claimed that the reshoots were to make the movie feel more tonally similar to that preview (though not to the point that there would be jokes inserted in every scene), and Warner Bros wasn’t sparing any expense to make that happen. However, Jai Courtney attributes the reshoots purely to action, which fits given how many fights and stunts the movie will feature. That said, maybe there will be some extra funny scenes shot on top of their action-heavy focus. Courtney’s covered on humor either way as Boomerang had plenty of funny moments in the last trailer, from freaking out after being cut out of the body bag to sipping that energy drink during a mission. You can check out the video below to hear Courtney’s full Suicide Squad comments, including how he originally felt about taking the Boomerang role. Centered around a group of incarcerated super villains who are sent on dangerous missions in exchange for leniency, Suicide Squad will see Boomerang working in the field alongside Deadshot, Harley Quinn, Killer Croc, El Diablo, Slipknot, Rick Flagg and Katana. The movie also features Amanda Waller as the government official giving the Squad orders and The Joker…well, what he always does: causing chaos. It’s the third entry in the DC Extended Universe, and Warner Bros is reportedly so pleased with it that they’re already interested in bring back the crew for Suicide Squad 2. Compared to last month’s Batman v Superman: Dawn of Justice, which was knee-deep in darkness, right now Suicide Squad looks like it will be a lighter affair, and certainly one of the more unique superhero movie offerings.